It's my son's 25th birthday and I so wanted to make a card as special as he is. I had some very elaborate plans that involved the use of window sheets and clever placement. However, my body didn't cooperate! Since I was battling against a misaligned rib, I was moderately pleased with this card. The lighthouse represents the ray of light that my son is in my life. I started with a piece of Smoky Slate cardstock and stamped and masked and sponged. I made the mask for the crescent moon with a Post It Note and the 1" circle punch. 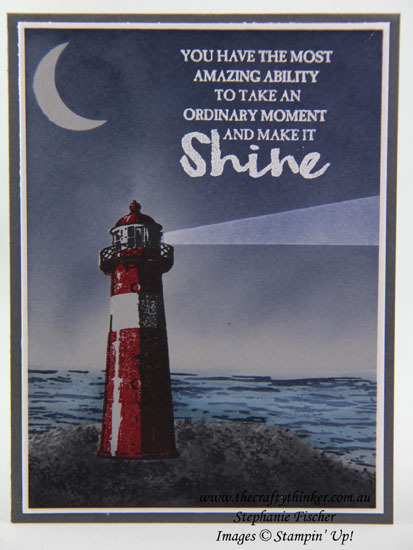 The lighthouse was stamped with Basic Black and Real Red inks then masked. The rocky outcrop was stamped with Basic Grey ink. I then randomly stamped part of the same stamp with Basic Black randomly and sponged the bottom of the card with Basic Black ink. I then masked the rocky section. The sky was sponged with Night of Navy ink and the light beam was stamped, several times to increase the intensity, with Whisper White Craft Ink. The sea was stamped with Night of Navy ink and then sponged with Marina Mist. I also added a streak of Whisper White as a reflection of the light beam. 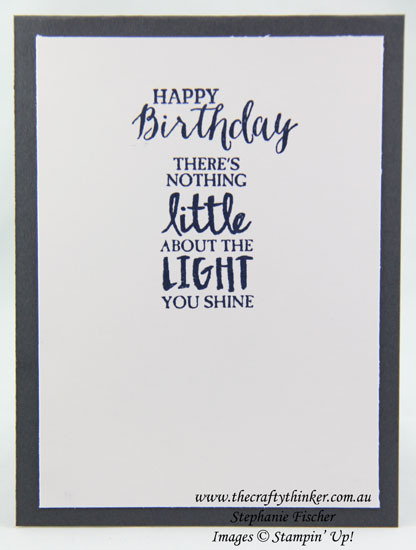 I removed all the masks, used my Embossing Buddy and stamped the greeting with Versamark before heat embossing with Whisper White embossing powder.